There are 4 easy ways to embed a photo in your post. METHOD #1: Using [IMG] codes. 1. Upload your photo to a photo website, such as Imgur or Photobucket. I will use Imgur in my examples. 2. Once you upload the image, find the code that begins with "[IMG]"
but it will show up as the photo itself once you hit "preview post" or once you've submitted the post. 5. Hit "OK" and your photo will have been inserted into your post. 1. If your image is from Facebook, or Google, or some other website where the image already exists, you can copy the direct link by copying the location of the photo. To do this, simply "right-click" on the image, and select "Copy Image Location." This automatically copies the direct link to the image. METHOD #4: Attaching an image. 1. If you would prefer to attach an image in your post, rather than embedding it, click on the paperclip "Attachments" button. 2. A pop-up window will appear. Use the "browse" button to find an image, then click on "Upload." 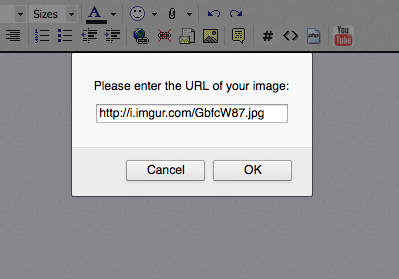 Once you have uploaded all the images you want to attach, click on "Close this window." 3. The images will not appear in the draft post, but they will appear once you hit "submit post". To make sure they will be attached, you need to scroll down and find them under "Additional options" underneath your post. One of these 4 methods should work. If you have further difficulties, do not hesitate to contact a moderator. Last edited by alessia55; 08-17-14 at 05:37 PM.. Thanks for sharing, I didn't know there were all these different ways to post photos here. I've been using the [ i m g] method up until now. Does it work the same way for smart phones? Yes. This may be a stupid question to some but my phone and forums are all new to me! Although I could probably just ask my 9 yr old! I've tried to post every link on Imgur and nothing works...it says Post denied. New posts are limited by number of URLs it may contain and checked if it doesn't contain forbidden words. help please!!!! You have to have 5 posts first to post pics and links.